UNITED NATIONS, January 24 -- While the UN in New York dodges Press questions about Secretary General Ban Ki-moon's decision to deny his Deputy Asha-Rose Migiro a second term, the UN's Resident Coordinator in Tanzania Alberic Kacou has gone ahead to confirm and defend it. 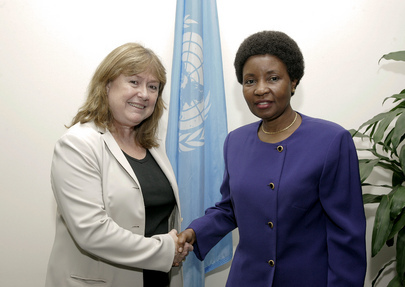 On January 21, Inner City Press reported that despite Migiro lobbying including through the African Group of UN member states, she was not getting a second term, seemingly to be replaced, as Inner City Press first reported in November, by Susana Malcorra of Argentina, currently embroiled in controversy about her Department of Field Support's failure to have military helicopters on hand in South Sudan when ethnic violence broke out at year's end. Inner City Press: have you seen that there is a comment by the Permanent Secretary of the Ministry of Foreign Affairs of Tanzania saying that Deputy Secretary-General Asha-Rose Migiro has confirmed that her time at the UN is done? Is that an accurate statement? But with the UN refusing to confirm, the UN Resident Coordinator in Dar es Salaam, Alberic Kacou, went ahead and said Migiro is "leaving in good faith... The changes are not for performance reasons and Dr Migiro knows it. She is going to stay there (at UN headquarters in New York) for a few months to assist with the transition." How can it be that while Ban's official spokesperson's office in New York refuses to answer a Press question on this, the UN system's resident coordinator in Tanzania answers the question, and more? On January 23, Inner City Press asked Nesirky during the noon briefing for Susana Malcorra to hold a question and answer briefing including to answer questions about DFS' failure to have military helicopters ready as foreseeable bloodshed began in Pibor in South Sudan. Watch this site.